Google Hangouts - How to organize and broadcast your video-conferences? Google Hangouts is a complete video conferencing tool open to all subscribers of the Google + social network, which emphasize on the organization of online virtual meetings and collaborative work. It also gives you the ability to broadcast a public video conference on Youtube (communicate about events, create turtorials...etc). How to organize a Hangout and take advantage of all its features? Google Hangouts mobile applications (Android, iOS). The Hangouts extension for the Google Chrome browser. The use of Google Hangouts requires a webcam, speakers (or headphones), Internet connection (broadband) and of course a Google account. Free audio or video conferencing with up to 10 participants. The opportunity to join a conference or to be contacted by telephone, via the Google Voice VoIP service (paid service). Send instant messages to other participants. Live broadcast of video conferencing on YouTube. How to start or join a Hangout from your PC? From Gmail: In the left column, you will find a feature to start video calls (a plugin is installed on first use). From there simply invite your contacts to join the video conference (invitation by e -mail, Google Plus circle, names). From Google +: Read Google Plus - How to schedule an Hangout? To facilitate the organization of a Hangout : add contacts to a Google + circle. Notify your contacts about the time of the hangout before sending the invitations. If necessary, create a web page dedicated to the event ( integrated feature). Use the virtual console available to the right of the screen to moderate the debates in real-time: it allows to control the audio or video stream of each participant or adjust the volume of a speaker . Choose the right environment (optimal lighting, no background noise.etc). Note that: the video stream of the active participant (speaker) is displayed in the middle of the window. The organizer must animate the Hangout and manage how the conference will unfold (who will speak first,..etc). Once their speech is done, participants must cut off their microphone to reduce noise interferences (The mute option is located top right). The screen sharing module as the name suggest allows you to share the screen of your computer with other participants (web browser, Office documents) . The YouTube module allows each user to share a YouTube video for simultaneous viewing. The Picture module is used to share screen captures during the hangout. 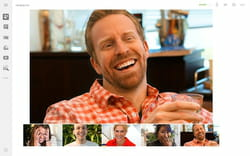 The "Hangouts On Air" service allows you to broadcast a live Hangout video-conference via a verified YouTube account. The broadcast is public and therefore accessible to a very large audience. Published by jak58. Latest update on November 11, 2013 at 06:15 AM by jak58. This document, titled "Google Hangouts - How to organize and broadcast your video-conferences?," is available under the Creative Commons license. Any copy, reuse, or modification of the content should be sufficiently credited to CCM (https://ccm.net/).